The following is a part-translation of the First Muqaddamah in ‘Khayrāt ‘l-Ḥisān’ of Ḥāfiẓ Shihāb ‘l-Dīn Ibn Ḥajar al-Haytamī al-Makkī with regards to some outrageous accusations against Imām Abū Ḥanīfah رحمه الله and its attribution to Ḥujjat ‘l-Islām Imām Muḥammad al-Ghazālī رحمه الله. Recently some people with ulterior motives (trying to hide their anti-Ḥanafī charade) have resorted to utilise such quotations making it apparent their lack of precision in taḥqiq. Know that some of the fanatics whom have not been granted success came to me with a book attributed to Imām al-Ghazālī containing within it such hideous fanaticism and repugnant debasement of the Imām of the Muslims, [and] one of the Mujtahid Imāms; Abū Ḥanīfah (May Allāh be pleased with him) such that ears are blocked out from hearing it and [such that] a fair minded individual upon hearing it will say: ‘If only it had not existed’! 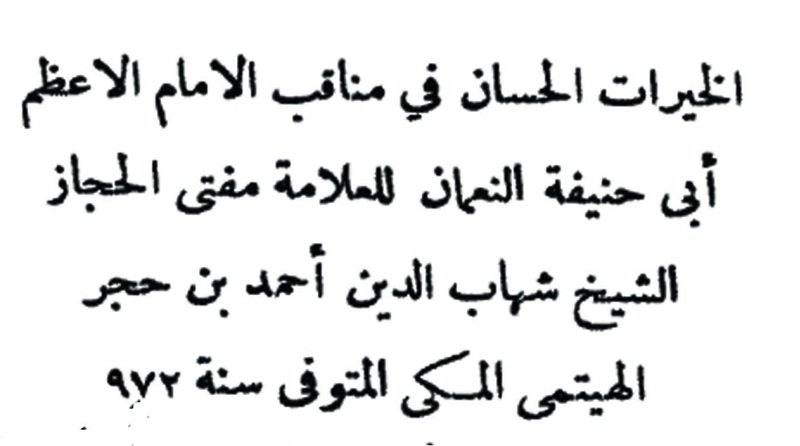 So that led Shams ‘l-A’immah al-Kardarī to speak at great length in refutation of that book, with the author of the refutation responding to wrong with wrong, in that he slandered al-Shāfiʾī (May Allāh be pleased with him) even more greatly than the [original] slander, And spoke at length in an un-praiseworthy manner. All this was on the basis that [the author] al-Ghazāli is the Imam Muḥammad Ḥujjat ‘l-Islām [the well known Ghazālī], whereas it is not him (Ḥujjat ‘l-Islam) due to the latter’s praise of Abū Ḥanīfah in his Iḥyā’ and his biography appropriately showing his (Abū Ḥanīfah’s) lofty status. Also the copy which I have seen has written upon it that this book is the writing of Maḥmūd al-Ghazālī and this Maḥmūd is not the [well known] Ḥujjat ‘l-Islām, and thus it is written in the footnotes of that copy: ‘This is a Muʾtazilī individual, his name is Maḥmūd al-Ghazālī, and he is not Ḥujjat ‘l-Islām’. [And on the assumption that this had indeed originated from the well-known al-Ghazālī] some of the Ḥanafī research scholars who took sacred knowledge from the Master Saʾd ‘l-Dīn al-Taftazānī said: ‘That was expressed by Ghazālī when he was embroiled in the disciplines of dialectic and gaining students [in the early days]. When he abandoned such partaking, and was showered upon with the vessels of gnosis and the awareness [of Allāh], he understood the truth and its people. He affirmed it [the truth] in its place and the proof for that is his statement in ‘al-Iḥyā”. A suitable title was given by the translator. According to the Muḥaqqiq of Khayrāt ‘l-Ḥisān the origin of this statement is from Shaykh ʿAlā’ ‘l-Dīn al-Bukhārī al-Ḥanafī (May Allāh have mercy upon him).